First trip to Israel? Seasoned visitor? Let Sokol Tours design the itinerary that is right for your family! Israel is full of excitement and action! Get some hands-on anti-terrorist training and learn to shoot. Go ATVing, travel off the beaten track on a jeep, explore bike trails around the country on a mountain bike, and hike to incredible sites. Discover the heights and depths of Israel through rappelling and caving, and try your hand at desert archery. Israel loves kids, and kids love being in Israel! Enjoy digging? Be an archeologist at an authentic Archaeological Dig or the Temple Mount Sifting Project. Too young to drive a car? 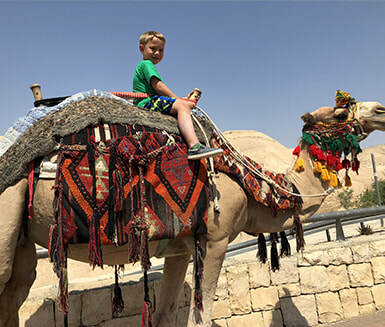 Go old-school and learn how to ride a camel or donkey! Hungry? 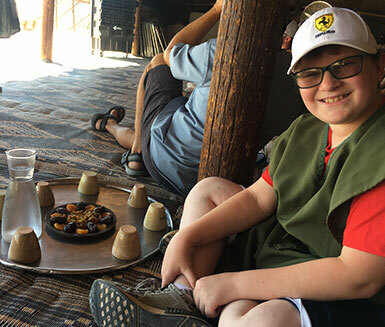 Bake fresh pita and tea over an open fire in the desert. 2,000 year old game of hide and seek? Explore amazing networks of tunnels and caves in the Judean Foothills. Breath deep and travel through the varied and incredible natural wonders of this land. Explore the desert, walk through waterfalls and springs, rest in a cool oasis, listen to the tranquility of an ancient forest, and discover breathtaking views. See Israel from different vantage points ranging from over 7,000 feet above sea level in the Golan to 1,300 feet below sea level at the Dead Sea. Discover the sites in the Bible in a hands-on way at the incredible archaeological finds throughout the country. Explore Hezekiah’s tunnel in the City of David. Walk through the Solomonic Gates at Megiddo. Climb up an Assyrian ramp used during the battle for Lachish. Explore a sacrificial alter at Tel Dan. Visit Abraham’s well in Be’er Sheva. 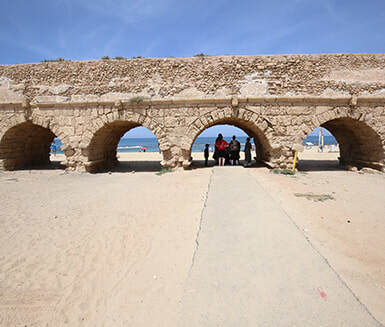 Tour an amphitheater and aqueduct in Caesaria, and check out an ancient bathhouse in Bet She’an. Travel along the timeline of battles that shaped the State of Israel! 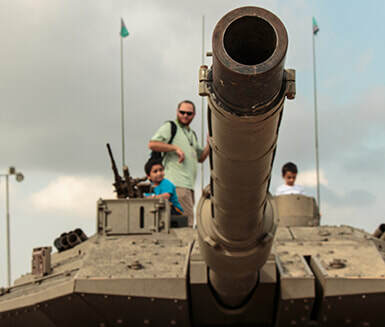 The year is 1948 and the War of Independence is underway- join a group of soldiers and hear their stories at the Palmach Museum, climb aboard tanks in the Latrun Tank Museum, and descend into the trenches of Castel. The Six Day War (1967)- visit the breakthrough point at a Golani lookout and learn about the crucial battle for Jerusalem at Ammunition Hill. In 1973’s Yom Kippur War, uncover bunkers set on a volcano at Har Bental, watch real-life footage of the Yom Kippur War at El Rom studios, and listen to the silence that remains at the Valley of Tears from one largest tank battles ever fought. See how the Jewish people of Israel lived 1,800 years ago! Explore ancient synagogues. Walk through the remains of ancient villages mentioned in the Jerusalem Talmud. Descend into ritual baths (mikva’ot) from antiquity. 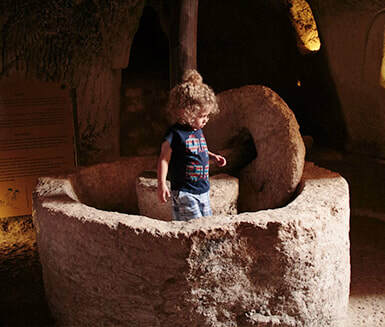 Learn how to press olives for oil and grapes for wine, and explore burial chambers throughout the country. 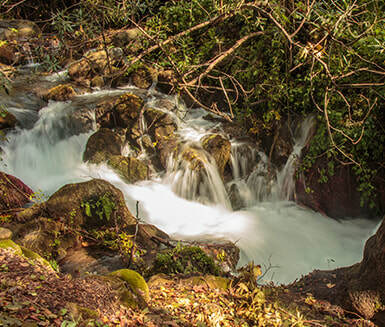 Discover today's environmental status throughout Israel and the growth of tomorrow's environmental projects! Visit the Eshkol Water Reservoir and learn how water travels from the Sea of Galilee to faucets at home. 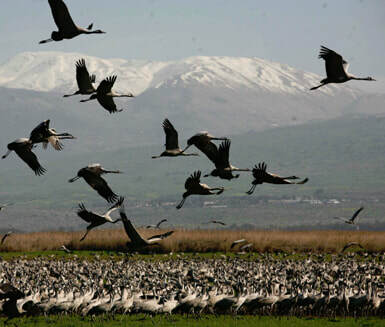 See how the Hula Lake was restored in the Hula Valley Reclaiming Project. Visit a Birding Center. Understand ecology as a way of life in Kibbutz Lotan's Creative Ecology Village! Israel is home to many different types of people and cultures. Visit the Jerusalem shuk (open air market), experience Druze hospitality and learn about the Bedouin way of life. Feel the depth and beauty of the Jewish people, and gain insight to the Christian connection to Israel. Become a wine connoisseur of Israel! The Bible mentions grape vines as one of the seven blessed fruits of Israel. 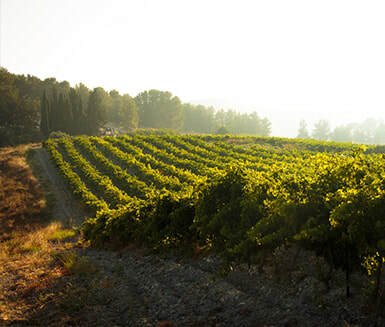 With over 300 wineries, large and small, Israeli wines cover the spectrum. Filled with a wide range of micro-climates, Israeli wines have won many international awards for their varied and distinct flavors. Travel to both large and small boutique wineries throughout the Golan and Galilee, Carmel, Samson region, Judean Mountains, and Negev. Let's get your tour started!